This is a bright and colorful orange and pink pendant. 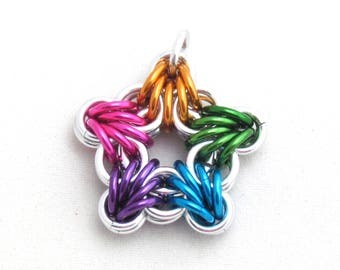 It is a piece of jump ring jewelry, also known as chain maille jewelry. 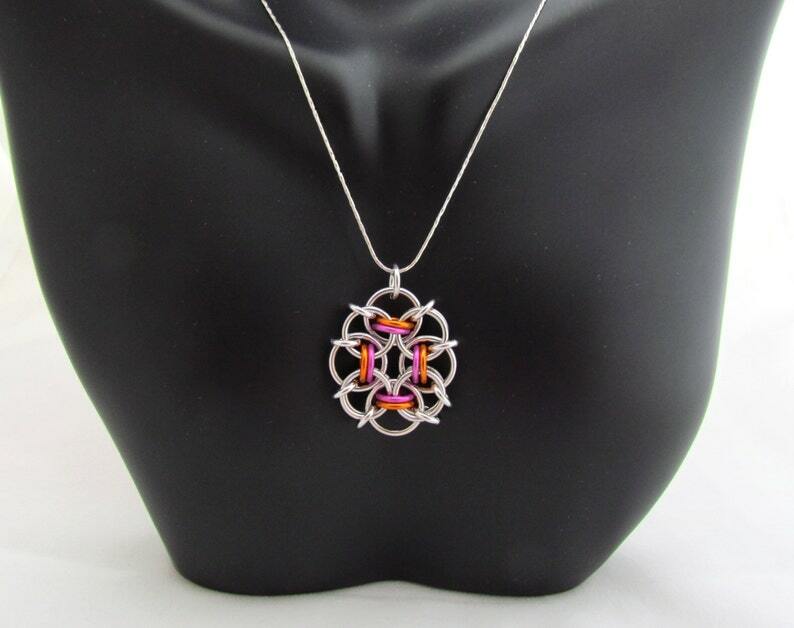 This small multicolor pendant is made out of anodized aluminum jump rings in bright orange and pink, as well as shiny plain aluminum jump rings. It measures approximately 1 1/4 inches from top to bottom (including the jump ring used as a bail), by 1 inch across. Aluminum is a very lightweight material, and the coloring will last a long time. It is possible, however, to scratch the coloring on the anodized rings if it comes in contact with harder surfaces. Please keep this in mind when storing and wearing. To clean, a mild soap, water, and soft cloth are all that are needed. If you have any questions or comments, please do not hesitate to contact me! There are more pendants available in my shop - take a look! Check out the rest of my shop as well!